1001plus: My Mother Was a Saint! I’m actually surprised that I hadn’t seen I Remember Mama before today. This seems like exactly the sort of movie that would have been shown on the old WGN Family Classics show when I was a kid. That was a Sunday morning show that ran old family films like Going My Way, Mysterious Island and Boys Town. I Remember Mama absolutely fits into that. Honestly, it may have been too long for the show. This is one of those “year or so in the life of a family” films where we’re going to see a series of events that happen to a particular family as they (switching into television announcer voice) struggle through the joys and tragedies of life in pre-World War I America. 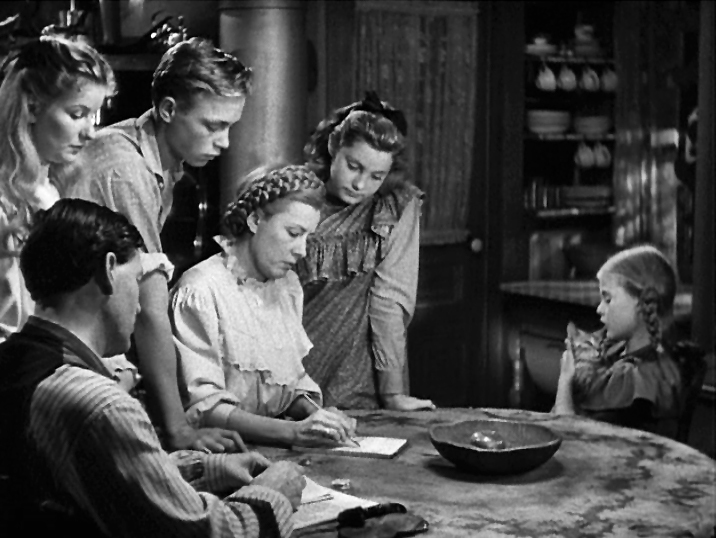 Our family in question is the Hansons, headed by father Lars (Philip Dorn), but really run by mama Martha (Irene Dunne). 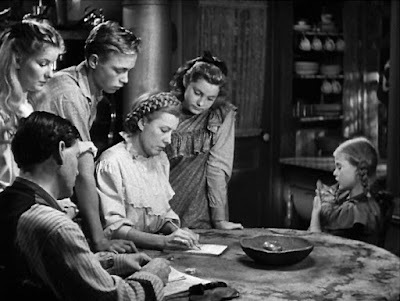 The Hansons have four children: son Nels (Steve Brown), youngest daughter Dagmar (June Hedin), middle daughter Christine (Peggy McIntyre), and oldest daughter and the storyteller of this film, Katrin (Barbara Bel Geddes). Also in the mix are Marta’s three sisters. These are the unpleasant aunts Jenny (Hope Landin) and Sigrid (Edith Evanson), and the timid but sweet aunt, Trina (Ellen Corby). I Remember Mama is an episodic story with very little that moves from one part of the tale to the next. Each bit is essentially encapsulated as its own little tale with only the characters moving from one story to the next. Overarching plot points include Trina wishing to get married to the local mortician (Edgar Goddam Bergen), Dagmar’s oddly named cat Uncle Elizabeth, and a constant problem with just barely making ends meet. Actually, while the Hansons are by no means wealthy, they seem to get along well enough. Another constant, at least for part of the film, is the family’s boarder, Jonathan Hyde (Cedric Hardwicke), a failed actor who keeps promising to pay his rent, but instead reads to the family from classic literature every night. Actually, there is one major thing that ties all of the stories together. That is the continual and freely given sacrifices of Marta Hanson for the benefit of her children. While she desperately wants a warm coat, she repeatedly gives up on having one because of something that the children want or need. More or less, every plot point in the film is heaped onto the back of Marta, who gamely trudges ahead to handle the problem. This isn’t to say that she is somehow put upon or a martyr. She’s actually genuinely appreciated by everyone in the family, and Lars Hanson, while he’s not in the film for large portions, seems to be at least a decent guy and a fairly attentive father. The one person I haven’t really mentioned here is the family patriarch, Uncle Chris (Oskar Homolka). Everyone but Marta is terrified of the man because of his large, black mustache and loud voice. What we discover as the film goes on is that Chris is loud and comes across as angry, but he’s really a big marshmallow who genuinely loves his family. When Dagmar suddenly needs an operation, it’s Chris who insists on taking her to the hospital and getting her that operation regardless of the cost. He also bonds with the children by telling them that he’s not too fond of their three aunts and that only Marta seems to be worth anything. The film can be summed up by a sequence of events that happens near the end. Katrin is graduating and desperately wants a set of hairbrushes and the like for her graduation present. Always willing to sacrifice, Marta trades the brooch she always wears to acquire the set for her daughter, who then is crushed with guilt when she discovers what her mother has given up for her when her sister Christine tells her. In this sequence, the three older kids all interact with their parents, and Lars sums them up. Christine is the stubborn one, since she’s sorry her mother is upset by what happened, but not sorry it happened. Nels is pegged as the kind one. Katrin, who goes into full-on waterworks is the dramatic one. Just how dramatic she is really needs to be summed up in a spoiler, since it’s also the end of the film. The entire movie is essentially told under the conceit of Katrin reading a novel that she has just written. She says multiple times in the course of the film that she wants to write, and in this case, she obviously has. But, true to her overly dramatic self, when a story she has written fails to sell for the 10th time, she decides to stop writing and eventually starts to rip up all of the stories she has written. Through Marta’s intervention in tracking down a famous author, Katrin is given the advice to write what she knows, which is obviously this film. That’s all fine, but we’re told at the end that she has sold the story to a magazine, and that the magazine has paid her $500. To put this in perspective, at least in modern terms with the money, this means that Katrin has been paid $12,500 by a magazine for a story about her mother. You can’t get $500 from a magazine today for a story. I Remember Mama isn’t a bad film, but it does come across as pretty twee. Irene Dunne is good an manages the role well without her becoming a melodrama star. I was less taken with the performances of Barbara Bel Geddes and Ellen Corby, both of whom were nominated in supporting roles. On the other hand, Oskar Homolka, who was himself nominated in a supporting role, is grand and a lot of fun. The film itself is fine without being anything exceptional. It’s a painless watch without being something I’m terribly excited to have seen. Why to watch I Remember Mama: It’s legitimately sweet. Why not to watch: It’s also a bit saccharine and it's far too long. Oskar Homolka was great in everything from Sabotage to Mr. Sardonicus! What a career he had! He's absolutely the most entertaining part of this. I was happy when he was on the screen. Blech! I don't know exactly what I expected when I sat down to watch this but it wasn't this gloopy misery fest. I enjoyed Ellen Corby because I always do and Homolka was fine but from the phony baloney accents through the coma inducing sugary-ness of most of the situations I longed to see the words "The End" which took far, far too long to arrive. Yeah, at 134 minutes, this is at least half an hour too long, and closer to 45 minutes more than is needed.